Terry, Boast, Tier, Bag, Howie, Harry, Jacko, Cut & Pani (Bill Trapani from Butterworth) made Mardi Gras '75. See the other 3 pages of it here. After Mardi Gras '75 and Jack and Harry's illustrious cross-country van trip with Tier, they all came back to Cromwell for the summer, during which time Harry threw his summer '75 party (above). 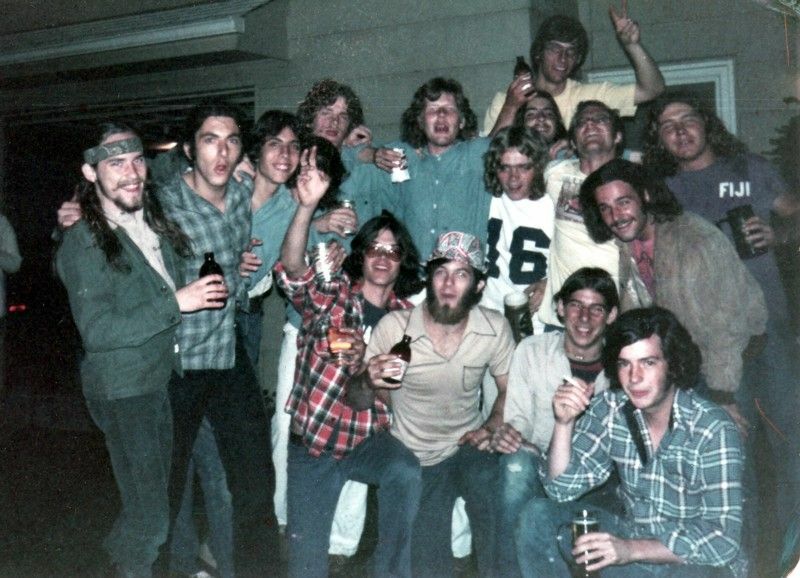 In this photo are Mike Buckley, Terry, unknown high school friend of Bag's, Lance, Cut, Hogie, Danny, Dave, Feather, Bummer, Tier, Bag, Harry, Kraft and Pablo. That summer also marked several excursions to the Jersey shore one of which is pictured left. Mike Featherstone sits next to Jethro Tull Meyer. Christmas '75 at the Hotel Gross playing cards and also out in the High Chamber for a group shot. In these 4 pictures are: Bogie, Hogie, Danny, Feather, Brother Dave, Terry, Harry, Varmit, Nancy, Howie, Bummer, Brett, Wiz, Rob, Odge, Tier, and Jacko. See more from this night here. New Year's Eve, December 31, 1975, at Steve McNair's. All of Cromwell and Butterworth jammed into one room, and Geb. So who is here? Paul Denz, Peggy Humphrey, Linda Sandelands and her date, Matt Varnum, Joe Brady, Bill Trapani, Steve Kean, Bob Allatta, Burton Berger, Tom Tierney, Jim Featherstone, Howie Finlay, Nancy Ming, Terry Gross, John Schneider, and more. See more from this night here.